My Uncle Denis died yesterday. He was my Mum’s brother and was a larrikin of the highest order but without question had the kindest heart of anyone I have ever known. His love for animals and his care for stray dogs, cats, any creature without a home was legendary. But he was broken. His marriage split up because of his alcoholism. He lost everything he ever had and was living in a caravan on my Aunt’s land in Donegal, Ireland. His two kids haven’t spoken to him for years. I spoke to him all the time because I could see how pure his heart was (and how great his sense of humour was) in spite of all the things covering it up like empty bottles of booze, an often belligerent attitude and three packets of cigarettes a day. Oh what we do to ourselves to cover up the holes in our lives…. Uncle Denis died a particularly horrible death, unfortunately. Throat cancer that ended up eating into his jaw. He had to have his whole tongue removed and be fed intravenously. It was horrendous. Yet he maintained his sense of humour – wry and black as it was. I’ll miss him a lot. I’ve been searching all day for photos of him but can’t find where I’ve put them so I’ll include this one instead that I saw on Facebook. 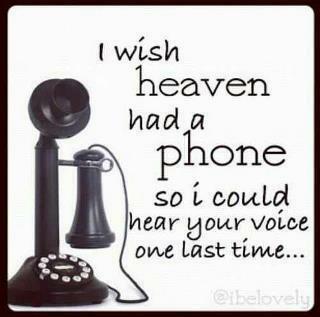 It made me cry a bit but it’s probably something most of us who have lost someone wish for. What a year it’s been. I’ll miss you my dearest Uncle Denis. I know now that you are no longer suffering and are at peace up in heaven with all your stray cats and dogs. I love you. My sympathies Selma, for you and your family, particularly your poor Mum who has been through her own scare. He sounds a lot like my brother – what a terrible way to go, not being able to talk and eat. Keep your chin up in the coming weeks. Big hugs and kisses! I’m so sorry for your loss, Selma. Like us all, it sounds like he had his issues, but it’s wonderful that you could see past them and appreciate the heart within. Hugs to you, Girl. It has been a difficult time for you, my friend and for Dennis but I would not like to be carrying the conscience of those who perhaps should have shown more compassion, but rejected him. More hugs coming your way, Selma. Sorry for your loss…but it sounds as if heaven has gained a kind soul…peace be with you. Oh Selma. I am so sorry for your loss. You’re in my thoughts and prayers. ah yes, i’m not the only one who gets to be in the presence of your kind heart :). It isn’t easy to love alcoholics, i know, my family is full of them. Bless you for loving old Denis warts and all, it’s a rare gift to love what the world rejects. Maybe on a windy day you might see him and his beloved creatures among the shapeshifting clouds. Let your light shine on Selma (with the moon and the stars and the sun). It does seem to have been a particularly sad year for you. I am sorry about your uncle but glad that you were able to see the person beneath the addictions. My condolences Selma. I am sorry for your loss. He shouldn’t have had to died like that. My dear one, I’m sending you many hugs and some kind thoughts for Uncle Denis. (I have a soft spot for those who love and care for the animals no one else seems to want). May your Uncle rest in peace, Selma. It’s often true that the kindest, gentlest hearts are the ones most grievously broken. May that heart of his finally find peace and happiness. What an awful year, Selma 😦 Hope 2013 is a much happier and more peaceful time for you. I’m so sorry for your loss, Selma. How wonderful that your Uncle knew such non-judgmental, inclusive LOVE from you. You sound like a great niece to have. Many prayers sent to you.